The Yakuza series of games have always been serious, testosterone-filled stories about hard men kicking each other's asses, broken up sporadically by mini-games, activities, and general fooling around. The latest game, Yakuza 5, is no different. 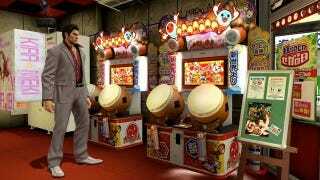 As previously reported, Namco Bandai's Taiko no Tatsujin appears as a fully playable game within the Yakuza 5 game. So what's it like, playing a video game within a video game, a la Inception? The game was pretty much the arcade version of Taiko no Tatsujin with two rounds of drumming for ¥100 in-game money with 3 songs to choose from at two difficulty levels apiece. Gameplay was simple and very fun. After I was done, going back to the Yakuza game was a little jarring. As fun as the drumming is, it does break the immersion of Yakuza 5 quite a bit. Still, it adds a level of variety and silly fun to an otherwise hard-boiled mafia brawler game.